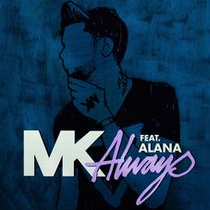 Route 94's remix of MK's classic 'Always' has been bubbling away for a while now and MOS teams up with Defected to give it a full release this summer. Having picked up a whole host of supporters across BBC Radio 1, Kiss FM, Capital & Capital Xtra, and constantly appearing in the UK's most Shazam'd Charts, 'Always' is definitely ready to be brought to the masses and could be a match for last summers #1 smash 'Look Right Through'. Check it out below.